Lock in a great price for Holiday Inn Hotel & Suites Lima – rated 8.3 by recent guests! Katrina at the front desk was extremely friendly and helpful. A very pleasant person to work with. The room was extremely nice the bed was comfortable, tv was cool, it was close to the elevator and laundry room and I loved the lobby it was extremely nice. It was typical HI. No idea the breakfast was not complementary ended up paying $27 for boxed eggs and non-crispy bacon. Room was not cleaned and had to call down for clean towels. I liked the hotel the location and the stay was nice. The friendly staff, the cleanliness, the ability to extend my check out time. The rooms were a good size and comfortable. The coffee in the room was the best that I have ever had in room. The pool was clean and nice size. Location, size and general cleanliness of the room. Holiday Inn Hotel & Suites Lima This rating is a reflection of how the property compares to the industry standard when it comes to price, facilities and services available. It's based on a self-evaluation by the property. Use this rating to help choose your stay! This central Lima hotel is less than 1 miles from East Gate Shopping Center. It features an on-site restaurant and offers accommodations with free Wi-Fi and a flat-screen TV. 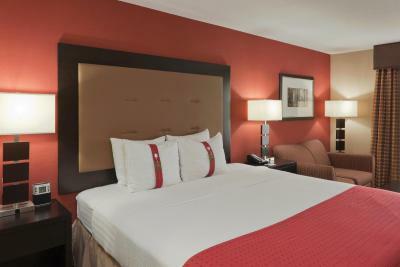 Every accommodation at Holiday Inn Hotel and Suites Lima features warm colors and modern décor. 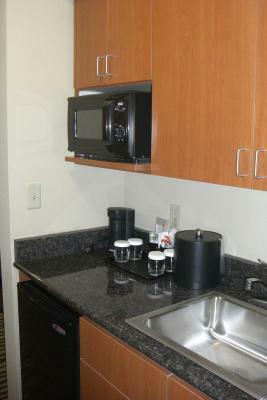 A microwave and mini-refrigerator are included in addition to the in-room coffee maker. A work desk and a telephone with free local calls are also included. Ken’s Restaurant and Lounge serves classic American dishes and is open for breakfast and dinner. The Lounge offers a full bar and features daily happy hour specials. The Lima Holiday Inn Hotel and Suites features an indoor pool as well as a fitness center and business center. Daily newspaper delivery is provided, and guest laundry services are available. Lost Creek Country Club and Lima Stadium are each a short drive from this hotel. Ohio State University is 3.2 miles away. When would you like to stay at Holiday Inn Hotel & Suites Lima? This room features cable TV, air-conditioning and a microwave. This spacious suite features a mini-bar and separate living area with a sofa bed. 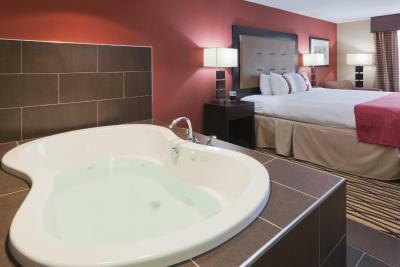 This spacious suite features a mini-bar and in-room hot tub. This room features cable TV, a coffee machine and a spacious living area. This accessible room features cable TV, a microwave and a coffee machine. This room features cable TV, a coffee machine and only a shower. This accessible room features cable TV, a coffee maker, ironing facilities and a microwave. House Rules Holiday Inn Hotel & Suites Lima takes special requests – add in the next step! Holiday Inn Hotel &amp; Suites Lima accepts these cards and reserves the right to temporarily hold an amount prior to arrival. Holiday Inn Hotel & Suites Lima accepts these cards and reserves the right to temporarily hold an amount prior to arrival. There is no suites with Jacuzzi rooms. It took me until the day we was leaving to find the room darkening blind so I feel it should always be partially exsposed so peopleknow its there I was trying to cover the window with a blanket to help cut out light from outside. There was no complimentary breakfast! There was only one luggage cart for a hotel of this size. Very frustrating. Sink did not drain and tub did not drain. People didn’t have control of their kids. Kids in the hallway playing obscene music on their phone. Kids running in and out of the hotel with no adult supervision. It was out of control. I think parents with kids should be on one floor. Fighting in the hallway that caused the police to be involved. Mostly just OK. No A/C in workout room.